Plain socks: shoe size 3-7 3 balls, 8-12 4 balls. Cable socks size 3-7 4 balls, 8-12 5 balls. Triangular scarf/ shawl 57x 220cm (22.5 x 86in), knitted : 6 balls. 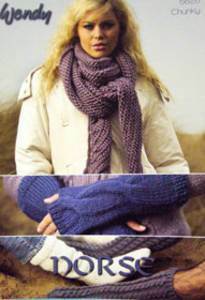 Armwarmers: 2 balls. Based on 50g balls Wendy Norse Chunky yarn. 6.5mm needles. 6.5mm circular for shawl. 6.5mm dpns for socks. Cable needle.